There are 46 days left in the PGCBL regular season, which ends on July 30. 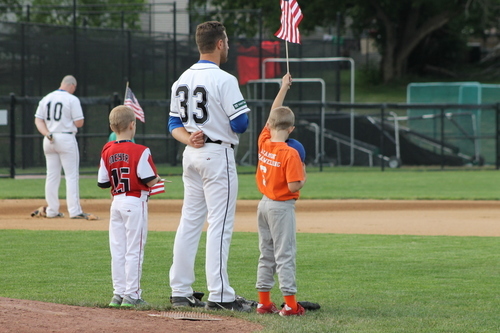 Glens Falls 2 Mohawk Valley 1 (Game One): In the first game of the doubleheader, the Glens Falls Dragons used strong pitching to defeat the Mohawk Valley DiamondDawgs, 2-1. Matt Sturchio picked up the win after tossing 6.1 innings of one-run ball before being relieved in the seventh by Michael Sinnott, who notched the save. Marc Iseneker allowed two runs in six innings in taking the loss for Mohawk Valley. A passed ball scored the first run of the game for Glens Falls in the bottom of the first. The Dragons added another run in the third to make it 2-0. JD Osborne hit an RBI double in the top of the fourth for the DiamondDawgs, but it wasn’t enough as Glens Falls went on to victory. Mohawk Valley 10 Glens Falls 5 (Game Two): After scoring just one run in game one of the doubleheader, the Mohawk Valley DiamondDawgs erupted for 10 runs in the second game, beating Glens Falls, 10-5. A wild pitch and a sacrifice fly got the DiamondDawgs on the board in the top of the first. Ryan Dodge hit an RBI single in the bottom of the first to make it a 2-1 game. Mohawk Valley then scored five runs in the top of the second—one on an error, another on a wild pitch, one on an RBI single and two on a JD Osborne home run. Ryan Hooper hit an RBI triple and Miguel Presno scored Hooper with an RBI groundout to make it a 7-3 game through two innings. Dodge hit an RBI single and Hooper got hit by a pitch with the bases loaded in the bottom of the fifth to make it a 7-5 game. In the sixth, however, Thomas Walraven hit an RBI double, Osborne hit an RBI single and Troy Scocca hit an RBI triple to finish the game’s scoring. Evan Kissinger picked up the win for Mohawk Valley while Robert Hardy allowed seven runs (three earned) in taking the loss for Glens Falls. Albany 9 Saugerties 2: The Albany Dutchmen scored early and often, going on to defeat the Saugerties Stallions in Saugerties, 9-2. A wild pitch scored Sean Aspinall for the first run of the game in the top of the first. Newcomer Zach Remillard, now in his third year with the Dutchmen, hit an RBI double to score Tyler Nelin for the second run of the inning and a Slayton Vaughn RBI groundout accounted for the final run of the inning. In the top of the second, Grayson Lewis hit an RBI single to extend the lead to 4-0 and Aspinall hit a sacrifice fly to make it 5-0. The early scoring didn’t stop there. Adam Gauthier hit a two-RBI single in the top of the third to extend the lead to 7-0. Chris Reynolds hit an RBI double in the bottom of the fourth to get a run back for Saugerties and Lawson Dunkin hit an RBI single in the bottom of the eighth to make it 7-2. In the top of the ninth, Jesse Cooper got in on the run-scoring action, hitting a two-RBI single to extend the lead to 9-2. Mike Reitcheck allowed one run over five innings to earn the win for Albany. Austin Von Herbulis allowed seven runs in 2.1 innings in taking the loss for Saugerties. Amsterdam 11 Adirondack 6: The Amsterdam Mohawks used a give-run sixth inning to go on and defeat the Adirondack Trail Blazers in Boonville, 11-6. Aiden McDermott got the scoring started in the top of the second with an RBI single for Amsterdam. Drew Freedman added an RBI single of his own in the inning to make it a 2-0 game. Adirondack cut the lead in half in the top of the third to make it a 2-1 game. Kyle Walker tied the game up in the bottom of the fifth with a solo home run. The big inning came in the top of the sixth. An error, an RBI groundout, a Justin Yurchak RBI single, a Hunter Tackett RBI triple and a Brendan Tracy RBI single accounted for the six runs in the inning. The Mohawks added a lone run in the seventh on a Drew Freedman RBI single to extend the lead to 8-2. Brendan Tracy hit an RBI double in the eighth to make it a 9-2 game. Also in the top of the eighth, Gage West hit a sacrifice fly to get the Mohawks to double digits. In the bottom of the eighth, Brad Jones was hit by a pitch with the bases loaded, Kyle Walker hit a two-run double and Luca Farina hit a sacrifice fly to make it a 10-6 game. Amsterdam added a lone run in the top of the ninth. Zach Logue allowed two runs (one earned) in five innings of work, striking out nine, to earn the win for Amsterdam. Christian Doughty allowed two runs (both earned) in 3.2 innings for Adirondack in taking the loss. Newark 4 Utica 2: The Newark Pilots scored two runs in the bottom of the eighth to take the lead for good and defeat the Utica Brewers in Newark, 4-2. Kyle Norman led off the bottom of the eighth with a double to set the table for the g0-ahead run. A walk and an error later, the bases were loaded for Anthony Spina, who hit into a fielder’s choice, but Norman scored to make it a 3-2 game. Willy Yahn scored on a wild pitch to add some insurance and make it a 4-2 game. Utica scored the first run of the game in the top of the first on a Zach Piazza RBI single. Newark took the lead in the bottom of the third on a Willy Yahn two-RBI double. A Taylor Olmstead RBI double in the top of the fourth tied the game at two. Cameron Hoos allowed no runs over the final inning and two-thirds to earn the win for Newark. Krystien Johnson-Batilan allowed the two runs (one earned) in the bottom of the eighth to take the loss for Utica. Elmira 4 Victor 3: After blowing a ninth inning lead, the Elmira Pioneers beat Victor in walk off fashion, 4-3, at Dunn Field. With the bases loaded in the bottom of the ninth, Tommy Mirabelli hit a walk-off single to give Elmira the win. This came after Elmira scored three runs in the bottom of the eighth to take a two-run lead, but a Dale Wickham two-run double in the top of the ninth tied the game at 3. Christian Santisteban led off the eighth inning with a hit by pitch for the Pioneers. A Sam Clark single and an error allowed Santisteban to score, tying the game at one. Tommy Mirabelli followed with a single to put runners at first and third and a walk loaded the bases. Two runs scored on a fielder’s choice to give Elmira the 3-1 lead. Victor scored its first run of the game on an error in the top of the sixth inning. Mike Stephens blew the save for Elmira, but got the win for the Pioneers. Austin Wilson allowed the Mirabelli walk-off single to take the loss for Victor. Amsterdam at Victor 3 p.m.: The Amsterdam Mohawks will face the Victor RailRiders for the first time on Sunday, facing the RailRiders in Victor. Elmira at Utica 5 p.m.: Two nights after Elmira beat Utica, 5-3, in Elmira, the two teams will meet again, this time in Utica. Albany at Mohawk Valley 6:35 p.m.: Albany and Mohawk Valley will square off for the first time this year on Sunday. Glens Falls at Saugerties 6:35 p.m.: With Saugerties currently leading the season series two games to one, the Glens Falls Dragons will look to even it up on Sunday in Saugerties. Adirondack at Newark 7:05 p.m.: Three nights after Newark walked off against Adirondack in 14 innings, the two teams will meet once again in Newark on Sunday.